STUDY 8′ 6" x 7′ 0" (2.59m x 2.13m) With uPVC window to the front, radiator and under-stairs storage cupboard. WC 3′ 5" x 5′ 9" (1.04m x 1.75m) With WC, wash hand basin and radiator. KITCHEN 8′ 8" x 12′ 3" (2.64m x 3.73m) With uPVC windows to the rear, tiled underfloor heating and door to Utility Room. Fitted with a range of modern base units and drawers with work surfaces over, Franke stainless steel one and a half bowl sink with mixer tap and black glass drainer, integral Neff ‘Bake off’ style electric oven with Neff hob and Neff extraction above, integral Neff dishwasher and wine rack. Wall mounted units, complementary tiling below, zoned LED spotlights, vertical feature radiator, space for an American-style fridge freezer and leading into the Dining Area. DINING AREA (LEADING INTO THE LOUNGE & KITCHEN) 7′ 9" x 8′ 8" (2.36m x 2.64m) With uPVC sliding doors to the rear garden and tiled underfloor heating. LOUNGE 14′ 8" x 11′ 11" (4.47m x 3.63m) With uPVC window to the front, radiator and views over open grassland. UTILITY ROOM 5′ 5" x 7′ 10" (1.65m x 2.39m) With doors to the rear, tiled underfloor heating, work surface, space for automatic washing machine and tumble dryer, wall mounted units, complementary tiling below, radiator and wall mounted gas central heating boiler. FAMILY BATHROOM 10′ 0" x 5′ 8" (3.05m x 1.73m) With uPVC window to the front, suite to comprise of; Whirlpool bath with integrated coloured lighting and shower over, WC, wash hand basin, radiator, LED spotlights and partly-tiled walls. 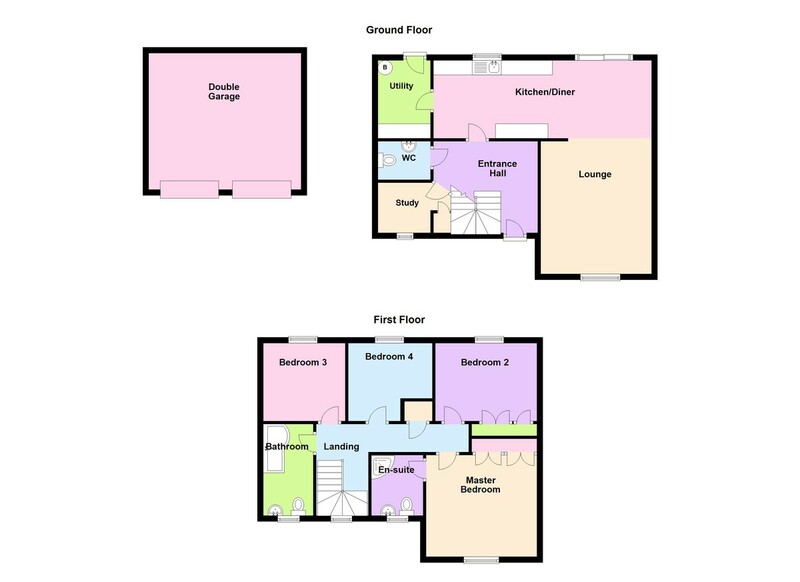 BEDROOM 1 12′ 0" x 11′ 2" (3.66m x 3.4m) With uPVC window to the front, radiator, fitted triple wardrobe and door to En-Suite. EN-SUITE 5′ 11" x 6′ 5" (1.8m x 1.96m) With uPVC window to the front, suite to comprise of; shower, WC, wash hand basin and radiator. BEDROOM 2 9′ 0" x 8′ 10" (2.74m x 2.69m) With uPVC window to the rear, fitted triple wardrobe and radiator. BEDROOM 3 8′ 6" x 11′ 4" (2.59m x 3.45m) With uPVC window to the rear and radiator. BEDROOM 4 9′ 5" x 8′ 9" (2.87m x 2.67m) With uPVC window to the rear and radiator. GARAGE 15′ 8" x 15′ 0" (4.78m x 4.57m) With power and lighting.